From the Daily News in Perth in 1948. Now we’re all for kids as scoreboard attendants… but not as scoreboard pests. Even an experienced defence is only as good as the midfield that protects it and the forward line that is supposed to counter with scoreboard pressure. – journalist Greg Baum, The Age, 14 July 2014. Match report Essendon defeated Collingwood by 64 points. 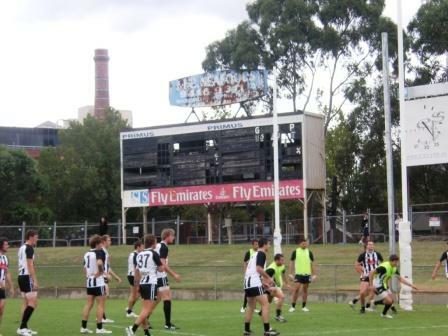 “I didn’t like the idea of them pulling down the scoreboard because I thought that should have been heritage listed.” Bob Hill, Collingwood scoreboard attendant at Victoria Park from the late 1960s to 1999. The Age 24 May, 2014. “The scoreboard is the mortal enemy of our develpoment team.” Williamstown FIDA coach Rob Klemm after his reserves team lost by 100 points to Kananook. May 2014. “Scoreboard pressure is magic pressure.” Stan Alves, ABC Grandstand . Western Bulldogs v Adelaide, 27 April 2014. “The scoreboard’s the scoreboard, the ladder’s the ladder and your wins and losses…reflect how you’re playing. It probably doesn’t reflect how we’re training and preparing for games – actually it doesn’t reflect it – but those bottom-line results also reflect your drawe, your injuries, the youth of your list, the inexperience of your list.” Brendan McCartney, Western Bulldogs coach. The Age, 23 May 2013. “That’s scoreboard pressure. They wouldn’t hesistate to run if they were, say, 5/270.” Barry Richards commenting during the Perth Test when South Africa were 5/71 in its first innings. South Africa went on to win by 309 runs. “We just wandered around and watched the scoreboard tick over.” Ian Chappell reflectinng on the whirlwind century by West Indian Roy Fredricks at the WACA in 1975. Channel Nine. November 2012. “And now Hawthorn have got the scoreboard pressure.” Rampaging Roy Slaven after Hawthorn scored the first goal of the 2012 Grand Final nine minutes into the first quarter. “Cloke and Dawe went goalless but that told only part of the story in a match in which the Collingwood midfield was completely monstered by West Coast ruckmen Nic Natanui and Dean Cox. The result was on the scoreboard for all to see.” The Age, Round 22, 2012. Collingwood lost by 49 points. “Although Western Bulldogs coach Brendan McCartney revealed he thought the Dogs had become “safe” with their ball movement, it can’t be helping the young forwards apply scoreboard pressure against seasoned back lines.” Matt Murnane, The Age, 1 August 2012. “The best pressure is scoreboard pressure.” Chris Connolly commenting during the Fremantle/Greater Western Sydney game, Round 17, 2012. Freo won by 90 points. Seems to me AFL coaches are becoming very adept at finding alternative scoreboards. Soon the game might be scored on artistic merit. Who knows? Is it possible shadowy figures like the Russian judge will simply hold up a scorecard at the end of four quarters, and that’s it? Week after week coaches and their assistants continue to develop a language best understood by themselves, hoping, I guess, to convince us Stephen Hawkin would find it hard to keep up. “We broke even in the inside 50s, we won the clearances and the uncontested ball differential indicates we should have finished a lot closer. “Ah but you lost by over 10 goals. ‘The customary ‘fire in the home-made drum between two cars’ job took place in the pocket at the northern end. Next to it stood the scoreboard where volunteers yelled encouragement for the home side during the match in-between kick-to-kick in the breaks.’ Sports photojournalist Shane Goss writing about a Yarra Valley Mountain District game between Alexandra and Kinglake. “There is nothing worse than looking up at the scoreboard in a game and seeing your side is 100 points down, no matter how many kicks you have got yourself. It is a team game and that is all that matters.” South Melbourne triple Brownlow Medallist Bobby Skilton, in an article about Garry Ablett’s form with Gold Coast. The Age, 5 June 2012. “I’m not too worried about scoreboard pressure as such. I try and build an innings and try and catch up at the back end.” Australian wicket-keeper Matthew Wade, after his maiden Test century against the West Indies. The Age, 26 April 2012. “We all love to win but what we are saying is the last thing you see is consistent scoreboard pressure, it is all the things before that.” Melbourne coach Mark Neeld after the Demons’ Round 4, 2012, loss to the Bulldogs by 21 points. “You can play four quarters that look good on the scoreboard, but the reason I was pleased is that it was four quarters of what we focused on, getting numbers around the ball, being physical and defending as a team.” Williamstown coach Peter German after the Seagulls defeated North Ballarat by 52 points. VFL, Round 4, 2012. Hobsons Bay Weekly. “You have to try and take the scoreboard out of it and get learnings from it – that’s what we’re doing.” Melbourne coach Mark Neeld after Round 3, 2012. The Demons had lost their first three games by an average of just under 70 points. New Bulldogs coach Brendan McCartney said a few days before the round 1 game against West Coast that people “look at the scoreboard a little bit” when marking a team and coach’s papers. “A team can be three goals up and look like champions and then be three goals down 20 minutes later and all of a sudden they’re no good.” Here at Scoreboard Pressure we wonder if the Bulldogs coach looked at the Etihad Stadium scoreboard when West Coast kicked nine unanswered goals across the third and fourth quarters. After Ricky Ponting took 11 balls to get off the mark against India at the Gabba on 19 February 2012 Channel 9 commentator Tony Greig said: “Ricky doesn’t want any more dot balls. This is what they call scoreboard pressure.” A few days later Ponting was dropped from the one-day team. And a day or so later he quit the one-day team. “Scoreboard incredibly difficult to read – white writing on pink. Even peering through prescription sunnies I can’t decipher it.” A tweet by Elizabeth Hurley, reported in The Age, 31 December 2011. Scoreboard Pressure’s guessing Ms Hurley was attending a Big Bash game involving her then husband-to-be, Shane Warne. “Collingwood need to put on some scoreboard pressure.” Channel Ten commentary half-way through the first quarter of the 2011 AFL Grand Final. At the time Geelong was 2.2 (14) and Collingwood hadn’t scored at all. “Collingwood putting on some scoreboard pressure now.” Channel Ten commentary half-way through the second quarter of the 2011 Grand Final, with Geelong 4.3 (27) to Collingwood 7.3 (45). It proved to be the Pies last hurrah, with the Cats going on to win by 38 points. “It would have been better if we’d converted earlier and had a bit more scoreboard pressure, but it didn’t work out that way and we dug ourselves a hole.” Albion ruckman James Philpot commenting on his team’s 35 point Grand Final loss to Spotswood. Albion kicked 2.8 in the first quarter and kept Spotswood goalless for the term. Final scores were 12.18 (90) to 7.13 (55). Source: The Hobsons Bay Weekly, 21 September 2011. 1970s Sturt champion Michael ‘Flash’ Graham remembers racism being present in the SANFL but is at pains to say that it did not impact him greatly. “There was name-calling…but names don’t hurt you unless you listen to them. It was always the opposition mob, and I’d always just point to the score.” – from Legends, The AFL Indigenous Team of the Century, by Sean Gorman. Published 2011 by Aboriginal Studies Press. ‘The Police Association this weekend takes its campaign for wage justice to AFL fans with video advertisements on scoreboards at the MCG and Etihad Stadium. “It’s clear, with Jimi Hendrix blaring from the scoreboard that this is not conventional footy. The Renegade Pub League plays a shortened form of the game peopled by musicians, music fans and drinkers.” The Age, 1 August, 2011. “Spotswood coach Chris O’Keefe also hit the scoreboard, finishing with seven majors.” The Hobsons Bay Leader newspaper, 2 August 2011, reporting Spotswood’s 277 point victory over Glen Orden. Not many, if any, scoreboards are directly behind the goals, so if O’Keefe really did hit the scoreboard seven times he probably kicked the ball out on the full, and the scoreboard attendant probably finished the day with a cracking headache. Spotswood ended up kicking 46 goals, with Jason Cloke bagging 16. “Lance Franklin was clearly fired up and his team-mates did early scoreboard damage.” A Fox Sports voice-over summarising the start of the Hawthorn vs Fremantle Round 19 2011 game. The Hawks kicked six goals to none in the first quarter. Then torrential rain in the second quarter threatened to do further scoreboard damage. “Carlton applying pressure on the scoreboard now.” Commentator Tim Lane, as the Blues pull away from Essendon in the third quarter of their Round 18 2011 game. “We held our own and the scoreboard probably didn’t give us credit for how we played.” East Perth official after the Royals lost to Williamstown by 71 points in a semi-final of the Foxtel Cup on Saturday 9 July at Etihad Stadium. “Damien Hardwick’s had them playing competitive footy. They’ve never let the scoreboard get in the way of the result.” – Richmond champion Matthew Richardson after Richmond didn’t get in the way of Carlton, who defeated the Tigers by 103 points in Round 15, 2011. Adelaide needs dynamic, but sporadic medium-sized players such as Patrick Dangerfield and Chris Knights to impact the scoreboard if it is to win. – The Age’s Will Brodie, in a preview of the round 11 2011 game between Adelaide and North Melbourne. North impacted the scoreboard to the tune of a 47 point win. Carlton full back Michael Jamison said tonight’s game against the reigning premier was “probably the most important game for a while” and the focus for every Carlton player was to meet key performance indicators. “We won’t be looking at the scoreboard too much.” – The Age, 8 April, 2011. “We’re hoping Granty and Liam Jones can get on the scoreboard.”- Western Bulldogs‘ Daniel Cross, talking about the Doggies’ forward structure, The Age, 20 March, 2011. But the Doggies’ home base, the Whitten Oval, no longer has the scoreboard at the Geelong Rd end, so Granty and Liam Jones may have trouble practising getting on the scoreboard. Box Hill began the game well…but they could not go on with it and failed to put any pressure on the scoreboard for the rest of the game. Brent Diamond, The Age, 13 September 2010, after Box Hill lost its preliminary final by 61 points to eventual premiers North Ballarat. Coach Blair smoothed the transition from Elizabethan England to regional Victoria by playing fast and loose with Shakespeare. The scoreboard on the far side of the Nangiloc Oval said it all: Kate v Pete, not Katherina v Petruchio. – Chris McAuliffe, in an Age article, 20 April 2010, about an Aussie Rules production of Shakepeare’s The Taming Of The Shrew. For every game there should be a scoreboard, ranging from the multi pixelled technicolour version at the Melbourne Cricket Ground to the rickety wooden affair at the Upotipotpon Oval. Scoreboard attendants are an acquired breed, often anonymous if they live inside the scoreboard structure such as the old ones at many league ovals, where an occasional diembodied hand might emerge through a tiny square in the scoreboard to make an adjustment. The rough boards of the country require great endurance in all sorts of weather. They are occasionally manned by small boys who might abandon their posts to kick a football of their own, thereby stretching the mystic bonds of communication between the goal umpire and the goal operator. Scoreboard flank or wing or pocket is that part of the arena adjacent to it – as in Members’ or Railway or Outer end or wing or pocket.